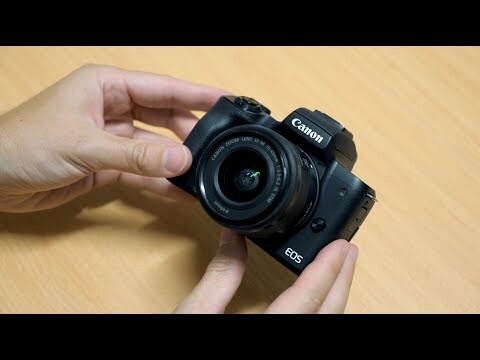 Comprising a versatile feature-set to suit both stills and video applications, the black EOS M50 Mirrorless Digital Camera from Canon separates itself from the pack with UHD 4K video recording, a high-resolution electronic viewfinder, and improved Dual Pixel CMOS AF with Eye Detection AF. Utilizing a 24.1MP APS-C CMOS sensor and DIGIC 8 image processor, improved Auto Lighting Optimiser helps to ensure clean image quality with low noise, along with top 10 fps shooting rate and a native sensitivity range of ISO 100-25600, which can be extended to ISO 51200 for working in low-light conditions. The sensor and processor combination also enables UHD 4K video recording at 23.98 fps, along with Full HD 1080p60 and HD 720p120 for slow motion capture. The sensor's design also facilitates Dual Pixel CMOS AF, which uses phase-detection autofocus for quick, accurate, and smooth performance to suit both stills and video use. Additionally, Combination IS 5-axis image stabilisation also helps to realize steady, shake-free recording by minimizing the appearance of camera shake. 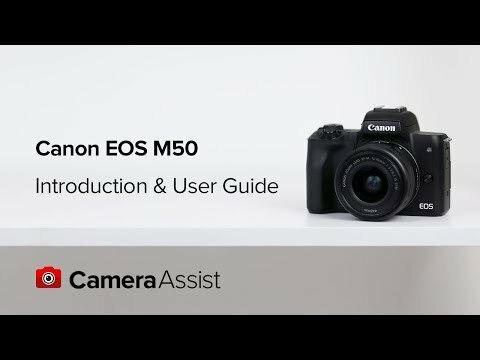 Bolstered by the accompanying Canon EF Lens, with the EOS M50 mirrorless camera’s 24.1MP APS-C CMOS sensor and DIGIC 8 image processor, high sensitivity and fast camera performance is delivered to suit both stills and video applications. A flexible ISO 100-25600 range, with an expandable ISO 51200 setting, suits working in a variety of lighting conditions, and the processing capabilities minimize noise and afford Auto Lighting Optimiser for notable clarity in various shooting situations. UHD 4K video recording is also supported at 23.98 fps, along with Full HD 1080p60 and HD 720p120 settings for slow motion recording. Additionally, the processor affords a 10-fps continuous shooting rate, fast camera start-up time, and short interval times between each frame for a more intuitive and efficient shooting process. When shooting video, a Movie Servo AF mode offers smooth and natural focusing when changing from different subjects or different distances within the scene, as well as the ability to specify tracking sensitivity, AF speed, and Face Tracking priority. Benefited by the Canon Touch AF system, rack focus is possible simply by touching elements within the scene on the touchscreen in order to change focus in an intuitive manner. Subject tracking in movies is also heightened due to the Dual Pixel CMOS AF system's ability to recognize subjects and maintain focus when working within changing or cluttered scenery. Combination IS uses the built-in 5-axis digital image stabilisation in conjunction with lens-based image stabilisation systems to effectively minimize the appearance of camera shake for sharper handheld shooting. This benefits recording while walking or moving, and can also be used in conjunction with lenses featuring optical IS for more effective overall stabilisation. Included with the EOS M50 Mirrorless Camera body is the versatile standard zoom Canon EF-M 15-45mm f/3.5-6.3 IS STM lens, which provides a 24-72mm equivalent focal length range. Three aspherical elements help to control chromatic aberrations and distortions throughout the zoom range and an optimised lens placement works to reduce flare and ghosting. An Optical Image Stabilizer works to minimize the appearance of camera shake by up to 3.5 stops for sharper handheld shooting and an STM stepping motor provides fast, smooth, and near-silent autofocus performance.